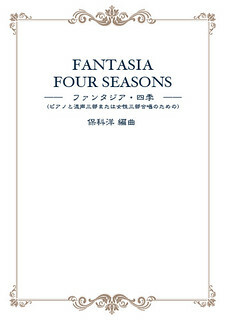 “Fantasia Four Seasons” is a medley of six Japanese favorite songs that represents the four seasons of Japan. Beautiful Japanese spring is depicted in the first two songs: “Haru no Ogawa” (A Stream in Spring) and “Sakura Sakura” (Cherry Blossoms). The next song, “Hotaru Koi” (Come Here, Firefly), is sung by children as they catch fireflies in the summer. The fourth song “Momiji” (Red Autumn Leaves) describes the gorgeous of a mountain valley that glows with the colors of autumn at sunset. For winter, “Yuki” (Snow) continues with joyful atmosphere of Fantasia and feelings of children amused by the snow falling. The last song “Furusato” (Hometown) evokes the image of home and the memory of past seasons. Arranged by Hiroshi Hoshina in 2012. Originally arranged for orchestra, Koto (Japanese zither), and chorus. All rights reserved. Contact us for inquiry and order.